Although there's no cure for psoriasis, treatments aim to keep it under control. Treatments include soap substitutes, creams, ointments, and lotions, some of which are especially for your face or scalp. If these don't control your psoriasis, you may try ultraviolet (UV) treatment (light therapy) and some medications that work on your skin or immune system. Many psoriasis treatments are only available on prescription from your doctor, and some are only available through a specialist. Doctors often recommend you use a product called aqueous cream instead of soap or body wash. You can buy aqueous cream from pharmacies, but it will be cheaper if your doctor prescribes it. Doctors no longer recommend using aqueous cream as a moisturiser. You can also get pine tar or coal tar washes from a pharmacy or on prescription. These may be worth trying, but they don't work well for everyone, and they stain bedding and clothing. For psoriasis on your body, your doctor may prescribe calcipotriol/betamethasone (Daivobet). Calcipotriol is a vitamin D analogue, which means it's a lot like vitamin D. It helps to slow down the speed at which you make skin and reduces inflammation. But it can also make your skin extra sensitive to sunlight, so you have to be careful when you're outside. Betamethasone is a steroid and, when combined with calcipotriol, is an effective treatment for psoriasis. Daivobet is a prescription medicine, so you can only get it through your doctor. Your doctor will provide advice on how to use this treatment. You can read information about Daivobet on Medsafe. Don't use calcipotriol products on your face or sensitive areas, such as inside your elbows or other skin folds, as it can irritate your skin. Your doctor may prescribe a steroid cream, especially for psoriasis on your face or sensitive areas. They'll also give you specific instructions on how to use it. Steroid creams work by reducing skin inflammation, redness, and itching. Make sure you use it as instructed because you can damage your skin if you use it incorrectly. Topical steroids are identified by their strength (also called potency), and they range from low potency, for example, 0.5 to 1% hydrocortisone, right up to very potent creams. If you use them correctly, steroid creams are very safe. A useful measurement when applying steroid creams is the finger-tip unit. One finger-tip unit (FTU) is measured as a thin line of cream from the last joint of your index (second) finger to your finger tip. Use this amount of cream to cover an area that's double the size of the palm of your hand. An average-sized man would use 20 g a day for one whole body treatment, or around 140 g a week. If you're using a moisturiser, apply this first, wait a few minutes, then apply the steroid cream. Use the steroid cream when your skin is red and inflamed and stop using it once the redness settles down. 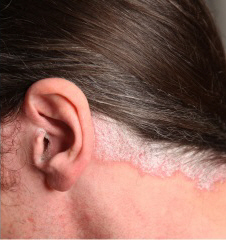 You can buy tar shampoos from the supermarket or pharmacy to help with psoriasis on your scalp. If this isn't working, your doctor may suggest you try a product containing betamethasone valerate (Beta Scalp). This is a steroid medication and is only available on prescription. You can also get a calcipotriol scalp lotion. For thicker scaling, a product called Coco-scalp may help. Use as directed on the packaging. If your psoriasis is very bad and not getting better with creams and lotions, your doctor may consider stronger medications, or refer you to see a dermatology specialist. If you're referred to a hospital or private specialist, they might prescribe ultraviolet treatment and oral medication (tablets). These are only available from specialists, not from your GP. Ultraviolet treatment, which is also called phototherapy, isn't the same as a sunbed. Sunbeds give off the wrong type of light to help psoriasis, and they increase your chances of getting skin cancer. If you have ultraviolet therapy, you'll have it at hospital. You may also be prescribed tablets to help settle down your psoriasis. Another treatment is called acitretin. This is a type of medicine called a retinoid, which means it's similar to vitamin A.
Acitretin works by slowing down skin production. You mustn't take it if you're pregnant or trying to get pregnant, as it can cause serious damage to a developing baby. You can't donate blood while taking this medication, or for two years afterwards. Other medications work by suppressing your immune system. Methotrexate is one of these types of medicine. It controls psoriasis well, but it can have serious side effects, such as causing liver damage and increasing your chances of getting infections.